26.03.2017 (Hvino News). Annual international fair of wine and alcoholic beverages – ProWein – was held in Dusseldorf, Germany. During the fair two Georgian wine tastings were organized at the stand of Vinum, the leading wine magazine, lead by executive editor Rudolf Knoll. 14 Georgian wines were represented at the tastings. As Rudolf Knoll stated, the interest towards the tasting was so intense, that it was attended by twice as many guests then expected. “The number of the guests exceeded all the expectations, that, in my opinion, is the result of the fact, that Georgia is already acknowledged worldwide as the homeland of wine. Surely, much interest is towards qvevri wine and Georgian varieties. I wish Georgian wine good luck and advances” - noted Rudolf Knoll. Read also: One day at ProWein Düsseldorf. Director of Georgian Wine Association Tina Kezeli remarked that Georgia has participated in ProWein since 2000, but Georgian wine has never had such representation. 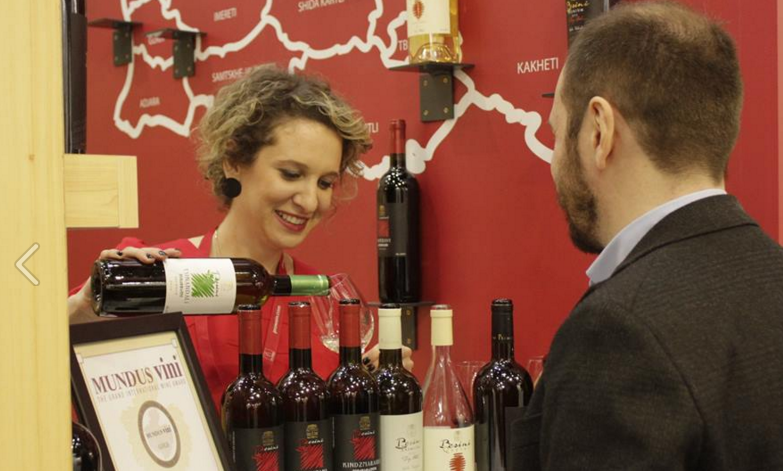 “This fair is very important platform for Georgian wine-makers. This is the world's number one fair in the wine-making field. Totally, 23 Georgian companies are represented on the stand, we have never had so many companies represented at this fair. More companies have interest and accordingly, we hope, that next year, Georgian stand will be even more representative. Especially notable is the interest towards qvevri wine” - stated Ms. Kezeli. Georgian Wines and Spirits Company Ltd.
Hvino News is proud to be the official media partner of ProWein since 2012 - the only publisher representing Georgia.